Thanks for the immense pic fest, Love. Anne looks great in everything, but I think her best color is red! I'll echo Meryl here and say Wow indeed!! LOL, when I went to bed last night this thread was only about 5 pages long! This is so great! Thanks for all these contributions Love! I think it's a great idea to draw attention in special threads to all the great actors and actresses in BBM, in addition to Heath and Jake. I've got interested in Anne via Brokeback .I've absolutely loved the character passionate,strong and indipendent of LUREEN NEWSOME .Lureen can be a gorgeous elegant woman and a very strong,fast cowgirl like a man and very good at work like a businessman at the same time.She has no fears..she's a lovely mother and a sweet wife.She has never obstaculated his husband and she has tried to stay in peace with all family.In the 1960' she has portrayed an emancipated figure of the Woman..all that a woman dream really to be I've discovered Anne in Brokeback mountain and whatever role could play in her future,everybody will remeber her one day as the great Lureen Newsome.Anne parsonify the red perfume Magnifique and Luree also is red passionate.I've read interviews of Anne and she said about her brave personality etcc. and I've realized once again that Anne IS Lureen. Thanks Love! I really, really like Lureen too. I think she can be a really interesting complex character to think about and discuss. I think her decisions in what she tells and encourages Ennis about on the phone are truly fascinating and reveal an impressive level of generosity in her character, even given all the heartache and bitterness that have crept into her life by that stage. Anyway, Lureen is suce a good role for Anne too, because it shows just how serious of an actress she can be. I'm really excited about Rachel Getting Married. It looks very interesting. Mille grazie, Love!! Wow, what a lovely tribute to our Anne. So many hours of work for you! 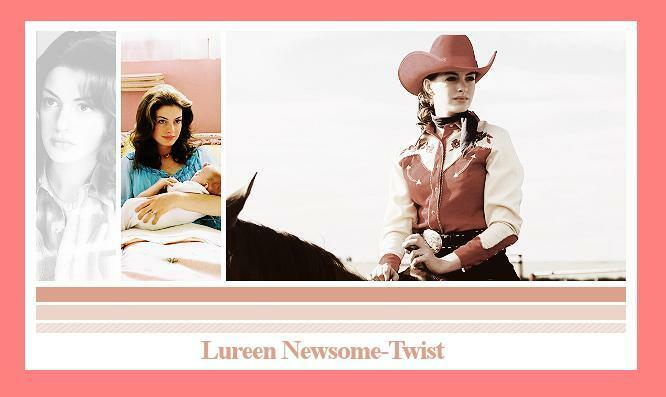 Speaking of Anne and the color red, I have Lureen's red cowgirl hat from the film, a prized possession. By the way, I think your myspace is brilliant.